Seaton Road is a warm, welcoming church fellowship, inviting everyone, from the youngest to the not so young to share in our worship, fellowship and various activities. 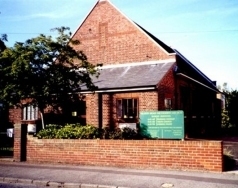 The church is very much part of the local community, providing facilites for various groups. Seaton Road are part of a three-way ecumenical initiative, Walton Parish Nursing. For more details on this please click here. Services: 9.45 a.m. – Worship & FUNKY. Cafe worship monthly – see church website for details. Large Print hymn books, service books, service sheets.